Lipman Law Firm, P.C. is a general practice firm that has experience in handling a variety of bodily injury claims both in court and through direct negotiations with the insurance company. Insurance companies are in the business of settling their claims for the least amount of money. They count on the reality that most individuals that have claims will not hire a lawyer. The lawyer, on the other hand, is in the business of maximizing the value of the insurance claim. If the insurance company is unwilling to pay a reasonable settlement, the attorney must have the expertise and willingness to take that claim into court. Lipman Law Firm, P.C. utilizes a team of professionals that take a pro-active role to provide its clients with first class zealous representation. The staff at Lipman Law Firm does not wait for the insurance company to order records and control the tone of the claim. We take immediate steps to prepare each claim including the use of private investigators, physicians who conduct record reviews, and economists or accountants who assess wage loss and earning capacity. Lipman Law Firm regularly employs the use of settlement brochures in settling claims. The settlement brochure is a sophisticated product that illustrates how the claim arose, sets out the legal standards that apply to the claim, reviews the injury and demonstrates how the value of the claim is calculated. The purpose of the settlement brochure is to communicate to the insurance company from a position of strength and to take the lead in negotiating the resolution of the claim. This high tech tool also communicates to the insurance company that we are serious about our resolve to maximize our client's claim and that we have a full understanding of each and every aspect of the case. This technique has been an extremely effective tool in serving our clients (as opposed to a simple demand letter) and one that is seldom used by other lawyers. In the event that your case requires court intervention, we are prepared to litigate your claim in a professional high tech manner. 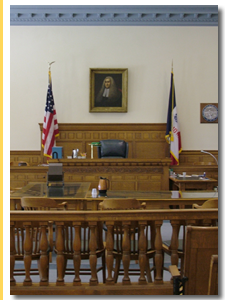 Jeff Lipman has tried cases as a personal injury lawyer, big and small in the Iowa District Court, Iowa Court of Appeals, Iowa Supreme Court, United States District Courts in Iowa, and the United States Court of Appeals for the Eighth Circuit. Jeff Lipman also has appeared in cases representing injured parties in various other causes of action in Illinois, Colorado, New Mexico, California and Kentucky.